Affordable and Convenient, Co-working Space that has easy answers to your professional space. Owing to its seamless connectivity with Delhi, Ghaziabad, Greater Noida, Gurugram and moderate price structure, Noida is riding high on the property bazaar. The place has great connectivity in terms on road networks via DND Flyway, Yamuna Expressway and NH24. Apart from the well-connected road network, Noida is suitably linked to the metro network which connects it to various parts of Delhi NCR. Also, thanks to the different IT/ITES offices, entertainment zones, industries, renowned healthcare institutes, schools and universities, Noida has gained tremendous popularity and interest among real estate builders and buyers who have chosen it to as their most favoured real estate destinations in Delhi NCR region. Today the city is brimming with great prospects and possibilities with several infrastructure projects from commercial to residential, from multi-use ventures to retail and office spaces showing their faith towards Noida, keeping in mind the trend of advanced infrastructure development. Many people believe that with such developments and advancements, only the big corporates can afford to have a property in Noida. Now, this is true to a relative extent, if you look from a startup or small business perspective. And if that is where you fit in, WorkWings is what you should look at. Based out of a thriving and developing Sector 63 in Noida, WorkWings provides a platform for professional success through co-working space. Co-working is a modern and urban style of work that involves sharing a working environment, but not in a typical office atmosphere. Without compromising on the professional aspects of a workplace, WorkWings lets you own your office just the way you want. 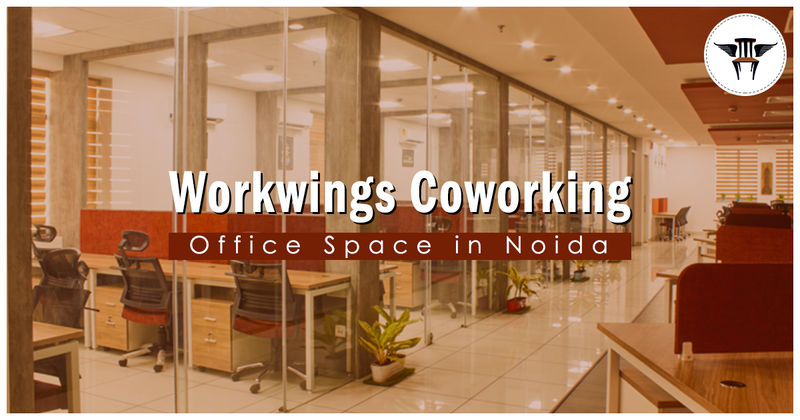 Apart from being pocket-friendly, WorkWings provides versatile office space for rent in Noida, it offers a meaningful connection between related communities. Unlike a traditional office, these connections in a flexible co-working space have members who work for a range of divergent companies, projects and ventures. So, if you are looking for shared office space in Noida at an affordable price that offers amazing office space that is both comfortable as well as resourceful in terms of unlimited high-speed internet, 24*7 access, cafeteria, meeting rooms, recreational area, advanced security, look no further. These features are pocket-friendly as well as versatile and can be customized as per your requirements. For example, if you are at an initial stage of setting up your startup with a small team but want to build an ambience like a typical corporate setup or if you have a large team but do not want to get into the hassle of maintenance and also want to keep the running cost low or if you are a freelancer working from home who is looking to build connections through purposeful communication to get the creative juices flowing, WorkWings will provide you what you are seeking in terms of your professional space. If you are wondering that these things are not possible at an economical price under one roof in Noida, we suggest you take a tour and see for yourself how you can easily transform your creative and professional energies through human opportunities. We’d love to hear your feedback, opinion and queries. That makes us work at the right direction. Please drop in your thoughts in the comments sections below.